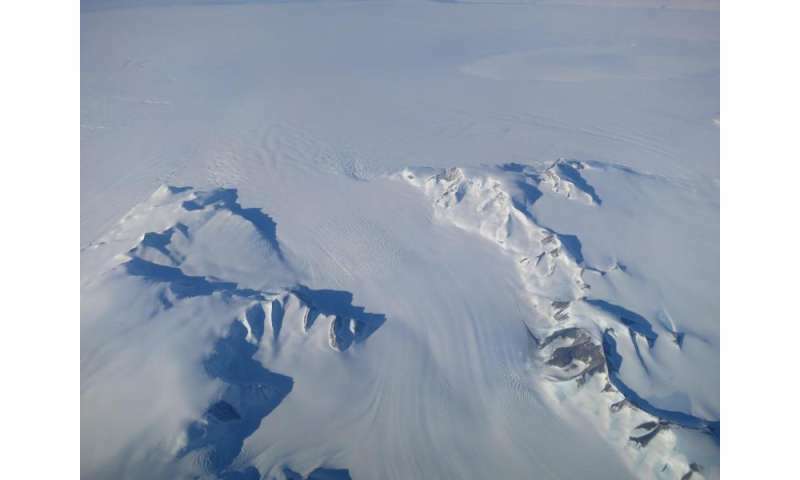 "We're essentially in agreement with other studies that show an increase in ice discharge in the Antarctic Peninsula and the Thwaites and Pine Island region of West Antarctica," said Jay Zwally, a glaciologist with NASA Goddard Space Flight Center in Greenbelt, Maryland, and lead author of the study, which was published on Oct. 30 in the Journal of Glaciology. "Our main disagreement is for East Antarctica and the interior of West Antarctica - there, we see an ice gain that exceeds the losses in the other areas." Zwally added that his team "measured small height changes over large areas, as well as the large changes observed over smaller areas." But it might only take a few decades for Antarctica's growth to reverse, according to Zwally. "If the losses of the Antarctic Peninsula and parts of West Antarctica continue to increase at the same rate they've been increasing for the last two decades, the losses will catch up with the long-term gain in East Antarctica in 20 or 30 years—I don't think there will be enough snowfall increase to offset these losses." 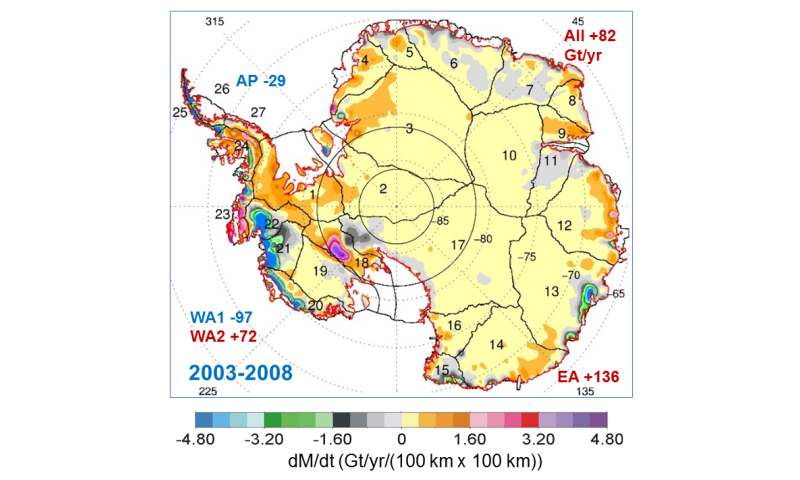 The study analyzed changes in the surface height of the Antarctic ice sheet measured by radar altimeters on two European Space Agency European Remote Sensing (ERS) satellites, spanning from 1992 to 2001, and by the laser altimeter on NASA's Ice, Cloud, and land Elevation Satellite (ICESat) from 2003 to 2008. "At the end of the last Ice Age, the air became warmer and carried more moisture across the continent, doubling the amount of snow dropped on the ice sheet," Zwally said. The extra snowfall that began 10,000 years ago has been slowly accumulating on the ice sheet and compacting into solid ice over millennia, thickening the ice in East Antarctica and the interior of West Antarctica by an average of 0.7 inches (1.7 centimeters) per year. This small thickening, sustained over thousands of years and spread over the vast expanse of these sectors of Antarctica, corresponds to a very large gain of ice - enough to outweigh the losses from fast-flowing glaciers in other parts of the continent and reduce global sea level rise. 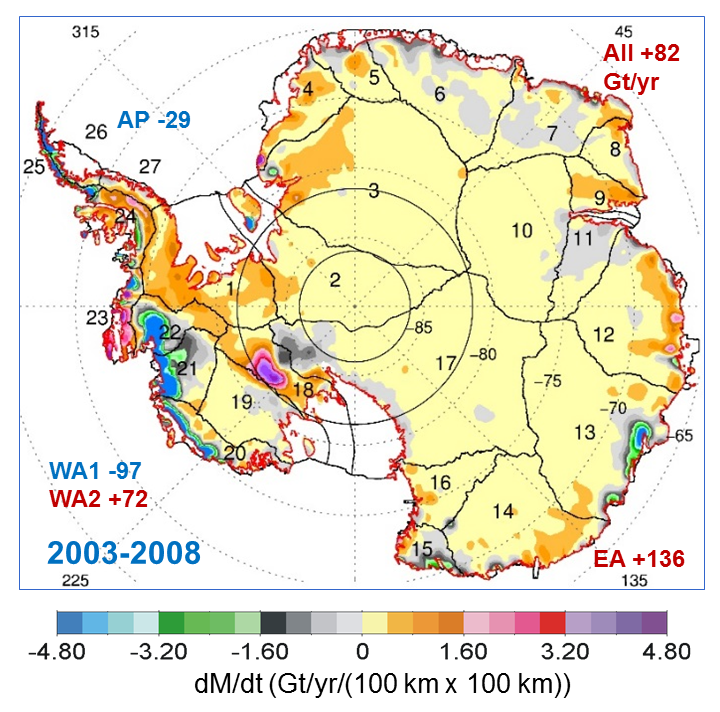 Zwally's team calculated that the mass gain from the thickening of East Antarctica remained steady from 1992 to 2008 at 200 billion tons per year, while the ice losses from the coastal regions of West Antarctica and the Antarctic Peninsula increased by 65 billion tons per year. "The good news is that Antarctica is not currently contributing to sea level rise, but is taking 0.23 millimeters per year away," Zwally said. "But this is also bad news. If the 0.27 millimeters per year of sea level rise attributed to Antarctica in the IPCC report is not really coming from Antarctica, there must be some other contribution to sea level rise that is not accounted for." 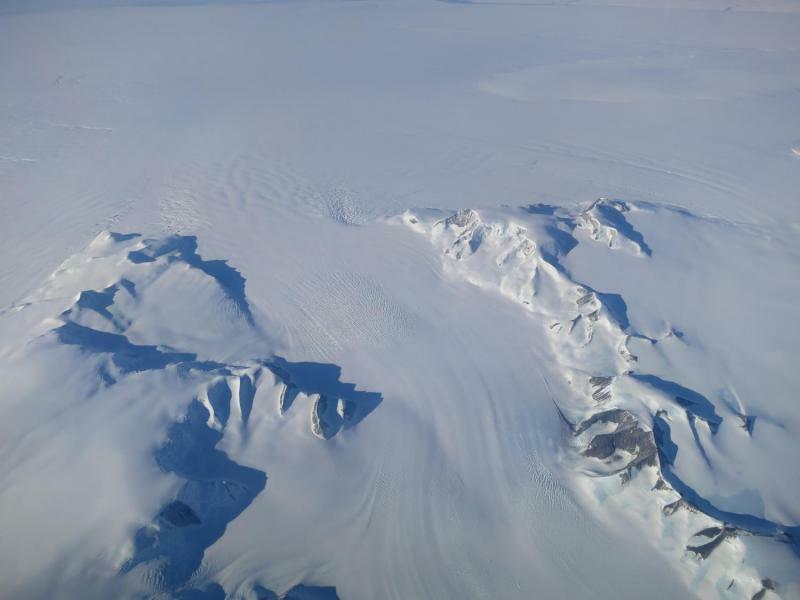 "The new study highlights the difficulties of measuring the small changes in ice height happening in East Antarctica," said Ben Smith, a glaciologist with the University of Washington in Seattle who was not involved in Zwally's study. "Doing altimetry accurately for very large areas is extraordinarily difficult, and there are measurements of snow accumulation that need to be done independently to understand what's happening in these places," Smith said. To help accurately measure changes in Antarctica, NASA is developing the successor to the ICESat mission, ICESat-2, which is scheduled to launch in 2018. "ICESat-2 will measure changes in the ice sheet within the thickness of a No. 2 pencil," said Tom Neumann, a glaciologist at Goddard and deputy project scientist for ICESat-2. "It will contribute to solving the problem of Antarctica's mass balance by providing a long-term record of elevation changes."